Growing up in NYC was awesome. I had the world at my fingertips and lived in the most coveted Island in the world but sadly I didn't appreciate it as much as I should have. Now that I'm older and live in Los Angeles I see exactly how awesome it is to be from there. But one thing that LA has over NYC is space! The kitchen in my NYC apt growing up was small and cramped, as was the one I had when I moved out to Queens but here in LA not only is my apartment spacious (and affordable) but my kitchen is probably the most beautiful one I've ever seen! The appliances are new, it's an open kitchen so I can watch TV or speak to people in the living room while cooking and I have a massive amount of space. Like I said, I have an open kitchen and being a blogger I tend to cook a lot. Which means the trash is usually always filling up with left over pieces of food. It's great to know that Hefty Ultra Strong trash bags have exactly what I need. Because I don't intend on being wasteful and taking out the trash every single day it's great to have the sweet scent of lavender & vanilla help keep my kitchen smelling fresh. 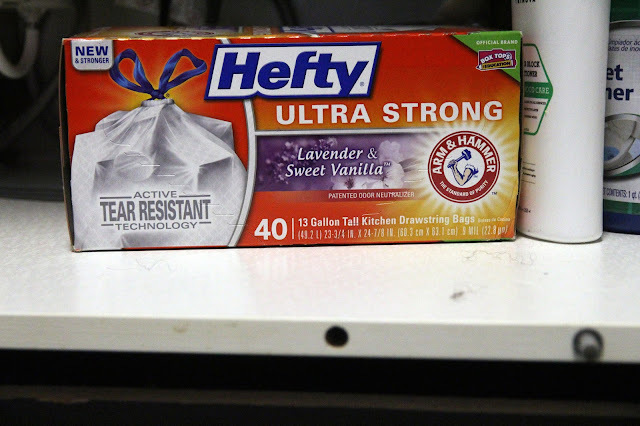 These Hefty bags use Arm & Hammer odor neutralizers and new, invigorating scents to help keep odors at bay. Plus, a scent-free option if you just want your trash bin to be neutralized. I like that these bags don't have an overwhelming scent but when I do go by my trash bin, or leave it open, it does release a sweet scent that I love. If you want to try these out and get some money back while doing so click here for a $10 coupon to Walmart after purchasing two or more Hefty trash bags. Instead of buying kitchen tool holders, re-use a jar that was filled with fruit or grains. I don't like having to buy things to store my utensils when I purchase so many things that come in glass or really good plastic containers. 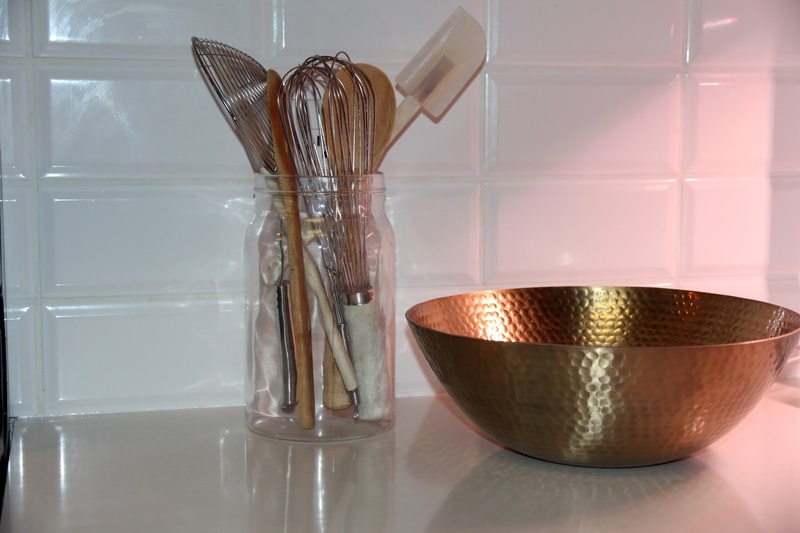 I like to keep my big utensils within arms reach of my stove and displaying them in something see through lets me keep my kitchen keep its modern and sleek theme without having too many colors. 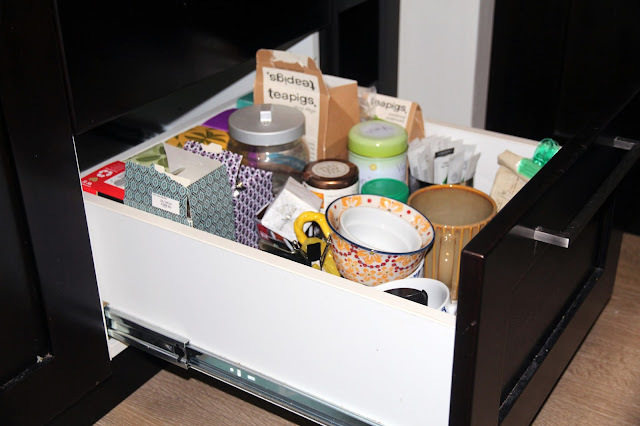 I use one of my kitchen drawers to store my tea and tea cups. I do think because even though I have tons of cabinet space, I don't like having to constantly move things around to find one thing. Using drawers is a great alternative to this. 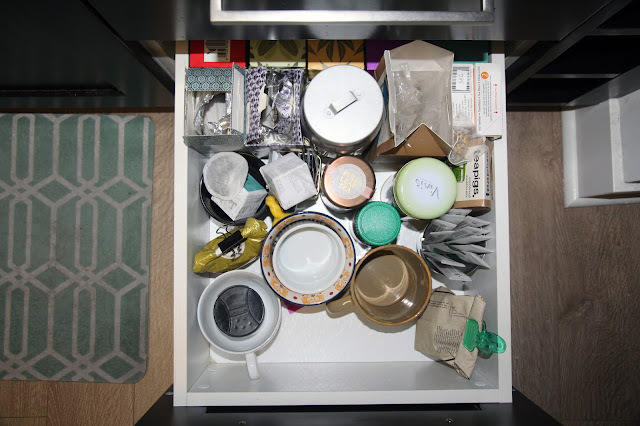 It fills up a drawer with things that are easy to find and isn't cluttered. I'm not very tall so I really don't use all of my cabinets because I refuse to constantly use my step ladder, especially if it's for something I use on a daily basis. I'm blessed with a closet for my washer and dryer as well as a pantry so I don't need to store all of my cleaning supplies under my sink. I keep that space free of clutter and only with things that that I can grab without moving things around. This lets me have easy access to my supplies as well as lets me see what I have/don't have, so that I don't overbuy products because I didn't see them. 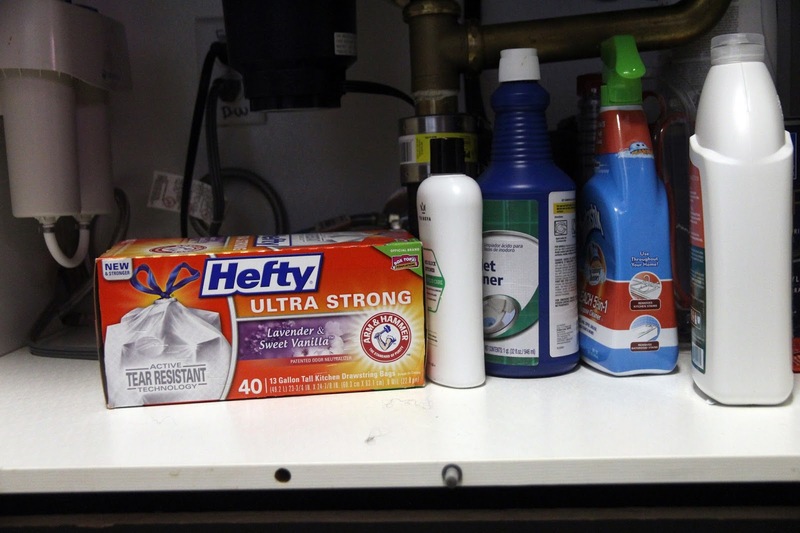 These are just a few of the ways I keep my kitchen tidy and totally useable all year round. As the seasons change, I'll be writing about my favorite ways to keep my kitchen updated with my favorite tools and gadgets!